2. 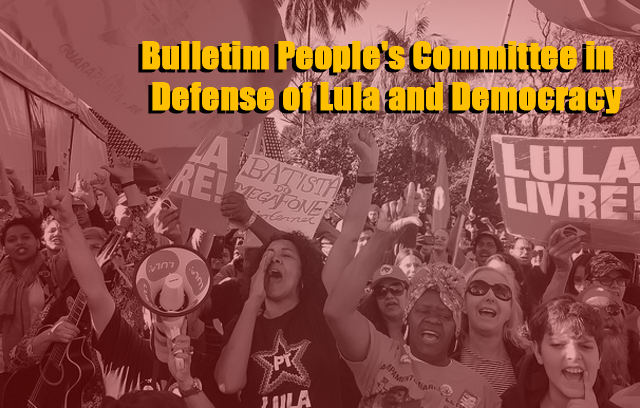 Since Judge Sergio Moro ordered imprisonment for Lula in a manipulated process without evidence, the World has perceived how the former President is being persecuted. This has now been further confirmed by Moro’s decision to leave the tenured position of judge to become a minister in Bolsonaro’s government. The argument that Lula is a political prisoner is supported by jurists from Brasil and around with world, former Nobel Prize laureates and many ex-heads of state, such as François Hollande, José Luiz Zapatero, Massimo d’Alema, and also for leaders such as Senator Bernie Sanders who is the most popular politician in the United States today. 4. The Lula Livre Vigil received two feminist samba groups from São Paulo today, November 3, the Amigas do Samba and Samba da Elis. Both groups sang and gave words of support for the activists who have been in Curitiba for 211 days, denouncing Lula’s political imprisonment and defending his freedom.